Hoath, S.D. (Ed), Fundamentals of Inkjet Printing: The Science of Inkjet & Droplets, Wiley-VCH (January 2016). Castrejón-Pita, J.R.; Castrejón-Pita, A.A.; Thete, S.S.; Sambath, K.; Hutchings, I.M. ; Hinch, J.; Lister, J.R.; Basaran, O.A., “Plethora of transitions during breakup of liquid filaments‘, Proc. Nat. Acad. Sci. 112 (15), 4582-4587,(2015). Hoath, S.D., ‘A simple model for DoD inkjet Frequency Response’, Proc. IS&T’s NIP31: 31st Intl. Conference on Digital Printing Technologies: Digital Fabrication, Digital Printing, 2015 (IS&T, Portland, OR, 2015), pp. 8-12. Hoath, S.D., ‘Standardization of inkjet drop speed measurement methods for printed electronics’, Proc. IS&T’s NIP31: 31st Intl. Conference on Digital Printing Technologies: Digital Fabrication, Digital Printing, 2015 (IS&T, Portland, OR, 2015), pp. 129-134. Hoath, S.D., Hsiao, W.-K., Martin, G.D., Jung, S., Butler, S.A., Morrison, N.F., Harlen, O.G., Yang, L.S., Bain, C.D., and Hutchings, I.M., “Oscillations of aqueous PEDOT:PSS fluid droplets and the properties of complex fluids in drop-on-demand inkjet printing”, J. Non-Newt. Fluid Mech. 223, 28-36 (2015); doi: 10.1016/j.jnnfm.2015.05.006. Jung, S., Hoath, S.D., Martin, G.D., Hutchings, I.M., 'Inkjet printing process for large area electronics', Chapter 11 )pp 317 - 343) in Flexible large area electronics, Mario Caironi and Yong-Young Noh (Eds) (Wiley-VCH, 2015). Rodriguez-Rivero, C., Castrejón-Pita, J.R., and Hutchings, I.M., ‘Aerodynamic effects in industrial inkjet printing’, Proc. IS&T’s NIP31: 31st Intl. Conference on Digital Printing Technologies: Digital Fabrication, Digital Printing,2015 (IS&T, Portland, OR, 2015), pp. 29-38. Castrejon-Pita, J.R., Hutchings, I.M., 'Perspective: the breakup of liquid jets and the formation of droplets', in Computational and Experimental Fluid Mechanics with Applications to Physics, Engineering and the Environment, L. Di. G. Sigalotti et al. (eds.). Springer (2014) 249-257 (DOI:10.1007/978-3-319-00191-3_12). Chen, J., Hutchings, I.M., Deng, T., Bradley, M.S.A., Koziol,K. K., Carbon 73 (2014) 421-431, ‘The effect of carbon nanotube orientation on erosive wear resistance of CNT-epoxy based composites’. Costa, H. L., and Hutchings, I. M., Proc. IMechE Part J: J. Engineering Tribology (2014), ‘Some innovative surface texturing techniques for tribological purposes’, DOI: 10.1177/1350650114539936. Ehtezazi, T., Dempster, N. M., Martin, G. D., Hoath, S. D., and Hutchings, I. M., J. Pharmaceutical Sciences, (2014), DOI: 10.1002/jps.24192, ‘Development of high throughput glass inkjet devices for pharmaceutical applications’. Hoath, S.D., Vadillo, D.C., Harlen, O.G., McIIroy, C., Morrison, N.F., Tuladhar, T.R., Jung, S., Hsiao, W.-K., Martin, G.D., and Hutchings, I.M., 'Ink-jet printing of weakly elastic polymer solutions', J. Non-Newt. Fluid Mech. 205, 1-10 (2014); doi 10.1016/j.jnnfm.2014.01.002. Hoath, S. D., Hsiao, W.-K., Hutchings, I. M., and Tuladhar, T. R., Physics of Fluids 26, (2014), 101701, ‘Jetted mixtures of particle suspensions and resins’. Hoath, S.D., Tuladhar, T.R., Vadillo, D.C, Butler, S.A., Mackley, M.R., McIlroy, C., Harlen, O.G., Hsiao, W.-K., and Hutchings, I.M., 'Jetting Complex Fluids containing Pigments and Resins', Proc. IS&T’s NIP30: 30th Intl. Conference on Digital Printing Technologies and Digital Fabrication 2014 (IS&T, Philadelphia, PA, 2014), pp. 30-33. Hoath, S.D., Vadillo, D.C, Harlen, O.G., McIlroy, C., Morrison, N.F., Hsiao, W.-K., Tuladhar, T.R., Jung, S., Martin, G.D., and Hutchings, I.M., 'DoD Inkjet Printing of Weakly Elastic Polymer Solutions', Proc. IS&T’s NIP30: 30th Intl. Conference on Digital Printing Technologies and Digital Fabrication 2014 (IS&T, Philadelphia, PA, 2014), pp. 152-156. Hoath, S.D., Hsiao, W.-K., Yow, H.N., Biggs, S., Butler, S.A., Mackley, M.R., Martin, G.D., and Hutchings, I.M., 'Colloidal Suspension Rheology and Inkjet Printing', Proc. IS&T’s NIP30: 30th Intl. Conference on Digital Printing Technologies and Digital Fabrication 2014 (IS&T, Philadelphia, PA, 2014), pp. 157-161. Hoath, S.D., Hsiao, W.-K., Jung, S., Yang, L.S, Bain, C.D., Wright, S.C., Morrison, N.F, Harlen, O.G., Martin, G.D., and Hutchings, I.M., 'Properties of PEDOT:PSS from Oscillating Drop Studies', Proc. IS&T’s NIP30: 30th Intl. Conference on Digital Printing Technologies and Digital Fabrication 2014 (IS&T, Philadelphia, PA, 2014), pp. 299-303. Hsiao, W.-K., Martin, G. D., and Hutchings,I. M., Langmuir (2014) 30 (41), 12447–12455, DOI: 10.1021/la502490p, ‘Printing stable liquid tracks on a surface with finite receding contact angle’. Lorber, B., Hsiao, W.-K., Hutchings, I. M., and Martin, K. R., Biofabrication 6 (2014) 015001, ‘Adult rat retinal ganglion cells and glia can be printed by piezoelectric inkjet printing’. Morton, C.E., Baker, R.C., and Hutchings, I.M., Flow Measurement and Instrumentation 36 (2014) 47–56, ‘Experimental investigation of an oscillating circular piston positive displacement flowmeter: I - piston movement and pressure losses’. Morton, C.E., Baker, R.C., and Hutchings, I.M., Flow Measurement and Instrumentation 36 (2014) 57–63 ‘Experimental investigation of an oscillating circular piston positive displacement flowmeter: II - leakage flows and wear tests’. Yang, L., Kazmierski, B., Hoath, S.D., Jung, S., Hsiao, W.-K., Wang, Y., Berson, A., Harlen, O., Kapur, N., and Bain, C.D., 'Determination of dynamic surface tension and viscosity of non-Newtonian fluids from drop oscillations', Physics of Fluids 26, 113103 (2014); doi 10.1063/1.4901823. Castrejon-Pita, J.R., Kubiak, K. J., Castrejon-Pita, A. A., Wilson, M. C. T., and Hutchings, I. M., Physical Review E 88 (2013) 023023, ‘Mixing and internal dynamics of impacting and coalescing droplets’. Castrejon-Pita, J.R., Baxter, W.R.S., Morgan, J., Temple, S., Martin, G.D., and Hutchings, I.M., Atomization and Sprays 23 (2013) 571-595, ‘Future, opportunities and challenges of inkjet technologies’. Ehtezazi, T., Davies, M. J., Seton, L., Morgan, M. N., Martin, G. D., and Hutchings, I. M., Drug Development and Industrial Pharmacy (2013), ‘Optimising the primary particle size distributions of pressurised metered dose inhalers by using inkjet spray drying to target desired regions of the lungs’ (LDDI-2013-0456) (doi: 10.3109/03639045.2013.858741). Hoath, S.D., Jung, S., and Hutchings, I.M., 'A simple criterion for filament break-up in drop-on-demand inkjet printing', Physics of Fluids 25, 021701 (2013). Castrejon-Pita, J.R., Hoath, S.D., Castrejon-Pita, A.A., Morrison, N.F., Hsiao, W.-K., and Hutchings, I.M., 'Time-resolved particle image velocimetry on a commercially available drop-on-demand printhead', Journal of Imaging Science and Technology 56,Issue 5 (Sept/Oct) 050401 (2012). Hoath, S.D., Jung, S.-J., Hsiao, W.-K. and Hutchings, I., “How PEDOT.PSS solutions produce satellite-free inkjets”, Organic Electronics, 13, 3259-3262 (2012). Hoath, S.D., Hutchings, I.M., Harlen, O.G., McIIroy, C. and Morrison, N.F., 'Regimes of polymer behaviour in drop-on-demand ink-jetting', Proc. IS&T’s NIP28: 28th Intl. Conference on Digital Printing Technologies and Digital Fabrication 2012 (IS&T, Springfield, VA 2012), pp. 408-411. Hoath, S.D., Harlen, O.G., and Hutchings, I.M., Journal of Rheology, 56(5), 2012, 1109-1127. 'Jetting behaviour of polymer solutions in drop-on-demand inkjet printing'. Hsiao, W.-K., Hoath, S.D., Martin, G.D. and Hutchings, I.M., 'Aerodynamic effects in ink-jet printing on a moving web', Proc. IS&T’s NIP28: 28th Intl. Conference on Digital Printing Technologies and Digital Fabrication 2012 (IS&T, Springfield, VA 2012), pp. 412-415. Hutchings, I.M. and Martin, G.D. 'Introduction to inkjet printing for manufacturing', In Hutchings, I.M. and Martin, G.D. (eds. ), Inkjet technology for digital fabrication, Wiley-Blackwell, 2012, pp.350, ISBN: 978-0-470-68198-5. Martin, G.D. and Hutchings, I.M. 'Fundamentals of inkjet technology' in Hutchings, I.M. and Martin, G.D. (eds. ), Inkjet technology for digital fabrication, Wiley-Blackwell, 2012, pp.350, ISBN: 978-0-470-68198-5. Betton, E. S., Hsiao, W.-K., Martin, G. D., and Hutchings, I. M., J. Imaging Science and Technology, Vol 55, 2011, 050606. 'Behavior of ink-jet printed drops on a corona-treated polymeric film substrate'. Castrejon-Pita, J. R., Hoath, S. D., Castrejon-Pita, A. A., Morrison, N. F., Hsiao, W.-K., and Hutchings, I. M., 'Ultra-High Speed Particle Image Velocimetry on Drop-on-Demand Jetting', Proc. IS&T’s NIP27: 27th Intl. Conference on Digital Printing Technologies and Digital Fabrication 2011 (IS&T, Springfield, VA 2011), pp. 93-96. Castrejon-Pita, J. R., Betton, E. S., Kubiak, K. J., Wilson, M. C. T., and Hutchings, I. M., Biomicrofluidics 5 (2011) 014112, 'The dynamics of the impact and coalescence of droplets on a solid surface'. Castrejon-Pita, J. R., Morrison, N. F., Harlen, O. G., Martin, G. D., and Hutchings, I. M., Physical Review E 83 (2011) 036306, 'Experiments and Lagrangian simulations on the formation of droplets in drop-on-demand mode'. Castrejon-Pita, J. R., Morrison, N. F., Harlen, O. G., Martin, G. D., and Hutchings, I. M., Physical Review E 83 (2011) 016301, 'Experiments and Lagrangian simulations on the formation of droplets in continuous mode'. Castrejon-Pita, J. R., Martin, G.D., and Hutchings, I. M., J. Imaging Science and Technology 2011, vol 55, 040305. 'Experimental study of the influence of nozzle defects on drop-on-demand ink-jets'. Hoath, S. D., Hsiao, W.-K., Jung, S., Martin, G. D., and Hutchings, I.M., 'Dependence of drop speed on nozzle diameter, viscosity and drive amplitude in drop-on-demand ink-jet printing', Proc. IS&T’s NIP27: 27th Intl. Conference on Digital Printing Technologies and Digital Fabrication 2011 (IS&T, Springfield, VA 2011), pp. 62-65. Hsiao, W.-K., Hoath, S. D., Martin, G. D., and Hutchings, I. M., 'Jetting, In-Nozzle Meniscus Motion and Nozzle-Plate Flooding in an Industrial Drop-on-Demand Print Head’, Proc. IS&T’s NIP27: 27th Intl. Conference on Digital Printing Technologies and Digital Fabrication 2011 (IS&T, Springfield, VA 2011), pp. 66-69. Hsiao, W.-K., Hoath, S. D., Martin, G. D., and Hutchings, I. M., Chilton, N. B., and Jones, S., Proc Nanotech 2011 Conference, Boston, June 2011, 'Imbibition dynamics of nano-particulate ink-jet drops on micro-porous media'. Jung, S., Hoath, S. D., Martin, G. D., and Hutchings, I. M., Journal of Non-Newtonian Fluid Mechanics 166 (2011) 297-306 , 'Experimental study of atomization patterns produced by the oblique collision of two viscoelastic liquid jets'. Jung, S., Hoath, S. D., Martin, G. D., and Hutchings, I. M., Journal of Imaging Science and Technology 55(1) (2011) 010501-010501-6, 'A new method to assess the jetting behavior of drop-on-demand inkjet fluids'. Martin, G. D., Castrejon-Pita, J. R., and Hutchings, I. M., 'Holographic Measurement of Drop-on-Demand Drops in Flight', Proc. IS&T’s NIP27: 27th Intl. Conference on Digital Printing Technologies and Digital Fabrication 2011 (IS&T, Springfield, VA 2011), pp. 620-623. Vadillo, D.C., Hoath, S.D., Hsiao, W-K., and Mackley, M.R., 'The effect of inkjet ink composition on rheology and jetting behaviour’, Proc. IS&T’s NIP27: 27th Intl. Conference on Digital Printing Technologies and Digital Fabrication 2011 (IS&T, Springfield, VA 2011), pp. 568-572. Betton, E. S., Martin, G. D., and Hutchings, I. M., 'The effects of corona treatment on impact and spreading of ink-jet drops on a polymeric film substrate', Proc. IS&T’s NIP26: 26th Intl. Conference on Digital Printing Technologies and Digital Fabrication 2010 (IS&T, Springfield, VA 2010), pp. 301-304. Castrejon-Pita, J. R., Martin, G. D., and Hutchings, I. M., 'Influence of nozzle defects on drop-on-demand ink-jets', Proc. IS&T’s NIP26: 26th Intl. Conference on Digital Printing Technologies and Digital Fabrication 2010 (IS&T, Springfield, VA 2010), pp. 14-17. Hoath, S. D., Hsiao, W-K., Castrejon-Pita, J. R., Colgate, D. M., Jung, S., Hutchings, I. M., Yang, L., Morrison, N. F.,'Jet diameters and velocity profiles in continuous ink-jets', Proc. IS&T’s NIP26: 26th Intl. Conference on Digital Printing Technologies and Digital Fabrication 2010 (IS&T, Springfield, VA 2010), pp. 23-27. Hoath, S. D., Martin, G. D., and Hutchings, I. M., 'Effects of fluid viscosity on drop-on-demand ink-jet break-off', Proc. IS&T’s NIP26: 26th Intl. Conference on Digital Printing Technologies and Digital Fabrication 2010 (IS&T, Springfield, VA 2010), pp. 10-13. Hoath, S. D., Martin, G. D., and Hutchings, I. M., 'Improved models for drop-on-demand ink-jet shortening', Proc. IS&T’s NIP26: 26th Intl. Conference on Digital Printing Technologies and Digital Fabrication 2010 (IS&T, Springfield, VA 2010), pp. 353-355. Jung, S., Hoath, S.D., Martin, G.D. and Hutchings, I.M., Atomisation patterns produced by the oblique collision of two Newtonian liquid jets. Physics of Fluids, 2010, 22, p. 042101. Castrejon-Pita, J.R., G.D. Martin, and I.M. Hutchings, 'A large-scale print-head for drop-on-demand and continuous inkjet studies', Proc. IS&T’s NIP25: 25th Intl. Conference on Digital Printing Technologies and Digital Fabrication 2009 (IS&T, Springfield, VA 2009), pp. 107-110. Hoath, S.D. Hutchings, I.M., Martin, G.D., Tuladhar, T.R., Mackley, M.R., Vadillo, D., Links between ink rheology, drop-on-demand jet formation, and printability. Journal of Imaging Science and Technology, 53 (4), 2009, p. 041208. Hoath, S.D., G.D. Martin, and I.M. Hutchings, Methods & Results from the Cambridge Inkjet Research Centre, in NanoTech2009. 2009, Houston. Hoath, S.D.,Martin, G.D.and Hutchings, I.M., ‘A model for jet shortening in drop-on-demand inkjet printing’, Proc. IS&T’s NIP25: 25th Intl. Conference on Digital Printing Technologies and Digital Fabrication 2009 (IS&T, Springfield, VA 2009), pp. 75-78. Jung, S.-J., Hoath, S.D., Martin, G.D. and Hutchings, I.M., ‘A new method to assess the jetting behaviour of drop-on-demand inkjet fluids’, Proc. IS&T’s NIP25: 25th Intl. Conference on Digital Printing Technologies and Digital Fabrication 2009 (IS&T, Springfield, VA 2009), pp. 719-722. Martin, G.D. Advances in understanding the printing performance of ink jet fluids. in Inkjet technology showcase. 2009. Zurich. Vadillo, D., Mulji, A., Tuladhar, T., Jung, S. and Mackley, M., ‘The effect of inkjet ink composition on rheology and jetting behaviour’, Proc. IS&T’s NIP25: 25th Intl. Conference on Digital Printing Technologies and Digital Fabrication 2009 (IS&T, Springfield, VA 2009), pp. 736-739. Yokoi, K., Vadillo, D., Hinch, J., Hutchings, I., Numerical studies of the influence of the dynamic contact angle on a droplet impacting on a dry surface. Physics of Fluids, 2009. 21(7), p.072102. Hon, K.K.B., L. Li, and I.M. Hutchings, Direct writing technology-Advances and developments. CIRP Annals - Manufacturing Technology, 2008. 57(2): p. 601-620. Martin, G.D., S.D. Hoath, and I.M. Hutchings, Inkjet printing - the physics of manipulating liquid jets and drops. Journal of Physics: Conference Series, 2008. 105: p. 012001. Hoath, S.D., Martin. G.D., Castrejon-Pita, R. and Hutchings, I.M., ‘Satellite formation in drop-on-demand printing of polymer solutions’, Proc. IS&T’s NIP23: 23rd Intl. Conference on Digital Printing Technologies and Digital Fabrication 2007 (IS&T, Springfield, VA 2007), pp. 331-335. Hutchings, I.M., G.D. Martin, and S.D. Hoath, High speed imaging and analysis of jet and drop formation. Journal of Imaging Science and Technology, 2007. 51(5): p. 438-444. Martin, G.D., I.M. Hutchings, and S.D. Hoath., ‘Jet formation and late-stage ligament instability in drop-on-demand printing’, Proc. IS&T’s NIP22: 22nd Intl. Conference on Digital Printing Technologies and Digital Fabrication 2006 (IS&T, Springfield, VA 2006), pp. 95-98. Harlen, O., Morrison, N., Hoath, S., 'Jet break up of polymeric fluids in inkjet printing', Congress on Rheology August 5-10 2012 Lisbon Portugal. Hoath, S.D., IOP Conference on Science of Inkjet and Printed Drops, 8 November 2012, 'DoD ink-jetting of linear polymers'. Hoath, S.D., “A simple model for DoD Inkjet Frequency Response”, Proc. IS&T’s NIP31/DF2015: 31st Intl. Conf. on Digital Printing Technology and Digital Fabrication 2015 (IS&T, Springfield, VA, 2015). Hsiao, W.-K., Martin, G. D., Hoath, S. D., Hutchings, I. M, Hook, M., and Massucci, M., 'Evidence of print gap airflow affecting web printing quality', in Proc 29th Int. Conf. on Non-impact Printing, NIP29, Seattle, USA (2013). McIIroy, C., Morrison, N., Harlen, O., 'Thinning and breakup of polymeric threads', Congress on Rheology August 5-10 2012 Lisbon Portugal. Morrison, N., Harlan, O. and possibly June and Steve H., 'Inkjet printing of shear-thinning fluids', Congress on Rheology August 5-10 2012 Lisbon Portugal. Daly, R., Harrington, T.S., Martin, G.D., and Hutchings, I.M., (2015) Inkjet printing for pharmaceutics - A review of research and manufacturing. Int. J Pharm, 494, 554-567. Ehtezazi, T., Davies, M.J., Seton, L., Morgan, M.N., Ross, S., Martin, G.D., and Hutchings, I.M., (2015), ‘Optimizing the primary particle size distributions of pressurized metered dose inhalers by using inkjet spray drying for targeting desired regions of the lungs’, Drug Dev Ind Pharm, 41. 279-291. Mathues, W., McIlroy, C., Harlen, O.G., Clasen, C., ‘Capillary breakup of suspensions near pinch-off’, Phys. Fluids 27, 093301 (2015). Talbot, E.L., Yow, H.N., Yang, L. Berson, A. Biggs, S.R., and Bain, C.D., “Printing small dots from large drops’, ACS Appl. Mater. Interfaces, 7(6), 378203790, (2015). McIlroy, C., and Harlen, O.G., 'Modelling capillary breakup of particulate suspensions', Phys. Fluids, 26, 033101, (2014). Morrison, N.F., Harlen, O.G., Hoath, S.D., 'Towards satellite free drop-on-demand printing of complex fluids', Proc. IS&T’s NIP30: 30th Intl. Conference on Digital Printing Technologies and Digital Fabrication 2014 (IS&T, Philadelphia, PA, 2014), pp. 162-165. Talbot, E.L., Yang, L., Berson, A., Bain, C.D., 'Control of particle distribution in inkjet printing through an evaporation-driven sol-gel transition', ACS Appl. Mater. Interfaces, 6 (12) ???? , (2014). Talbot, E.L., Yang, L., Berson, A., Bain, C.D, 'Control of the particle deposition in inkjet-printed droplets', Proc. IS&T’s NIP30: 30th Intl. Conference on Digital Printing Technologies and Digital Fabrication 2014 (IS&T, Philadelphia, PA, 2014), pp. 440-443. Richez, A.P., Yow, H.N., Biggs, S. and Cayre, O.J., Progress in Polymer Science 38, Issue 6 (2013), 897 - 931, 'Dispersion polymerization in non-polar solvent: Evolution towards emerging applications'. Talbot, E.L., Berson, A., Brown, P.S. and Bain, C.D., 'Drying and Deposition of Picolitre Droplets of Colloidal Suspensions in Binary Solvent Mixtures', Proc. IS&T’s NIP28: 28th Intl. Conference on Digital Printing Technologies and Digital Fabrication 2012 (IS&T, Springfield, VA 2012), pp. 420-423. Tembely, M., Vadillo, D., Mackley, M.R. and Soucemarianadin, A., The matching of a "one-dimensional" numerical simulation and experiment results for low viscosity Newtonian and non-Newtonian fluids during fast filament stretching and subsequent break-up, J. Rheol. 2012 56(1), 159-183. D.C. Vadillo, W. Mathues and C. Clasen, Rheologica Acta, 2012, 'Microsecond relaxation processes in shear and extensional flows of weakly elastic polymer solutions'. DOI 10.1007/s00397-012-0640-z. Vadillo, D.C., Tembely, M., Morrison, N.F., Harlen, O.G., Mackley, M.R. and Soucemarianadin, A., Submitted to Journal of Rheology, 'The matching of polymer solution fast filament stretching, relaxation and break up experimental results with 1D and 2D numerical viscoeastic simulation'. (2012). Accepted. Berson, A., Talbot, E.L., Brown, P.S., Bain, C.D., 'Experimental investigation of the impact, spreading and drying of picolitre droplets onto substrates with a broad range of wettabilities', Proc. IS&T’s NIP27: 27th Intl. Conference on Digital Printing Technologies and Digital Fabrication 2011 (IS&T, Springfield, VA 2011), pp. 290-293. Morrison, N.F., Harlen, O.G., 'Inkjet printing of non-Newtonian fluids', Proc. IS&T’s NIP27: 27th Intl. Conference on Digital Printing Technologies and Digital Fabrication 2011 (IS&T, Springfield, VA 2011), pp.360-364. Morrison, N.F. and O.G. Harlen. Viscoelasticity in Inkjet Printing. in 11th Pan-American Congress of Applied Mechanics - PACAM XI, January 04-08, Foz do Iguacu, PR, Brazil, 2010. Yang, L. and C.D. Bain., ‘Liquid jet instability and dynamic surface tension effect’, Proc. IS&T’s NIP25: 25th Intl. Conference on Digital Printing Technologies and Digital Fabrication 2009 (IS&T, Springfield, VA 2009), pp. 79-82. 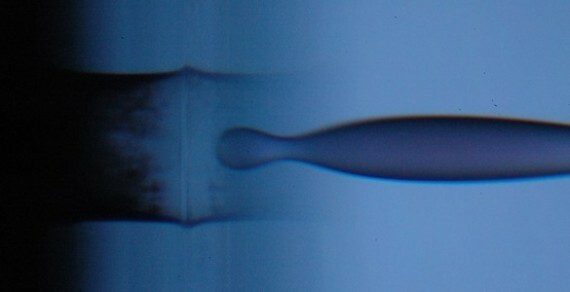 Stringer, J. and B. Derby, Predicting the morphology of adjacent inkjet printed droplets, Dynamics of Printed Drops, Institute of Physics, London, UK, 2008. Tuladhar, T.R. and M.R. Mackley, Filament stretching rheometry and break-up behaviour of low viscosity polymer solutions and inkjet fluids. Journal of Non-Newtonian Fluid Mechanics, 2008. 148(1-3): p. 97-108. Yarlanki, S. and O. Harlen, Jet Breakup of Polymeric Fluids, in ICTAM XXII. 2008: Adelaide. Yokoi, K., Vadillo, D. and Hinch, J. Numerical simulations of droplet impact on homogeneous and heterogeneous substrates, in Dynamics of Printed Drops. 2008, Institute of Physics: London. Stringer, J. and B. Derby, ‘Splashing of droplets on structured surfaces’, Proc. IS&T’s NIP23: 23rd Intl. Conference on Digital Printing Technologies and Digital Fabrication 2007 (IS&T, Springfield, VA 2007), p. 960.